Overt gambling had always been an integral part of Venice's fun zone. Razzle dazzle and layout games, where spinning wheels determined the prize winners, proliferated along the boardwalks and piers. Sometimes the games were rigged as fireman discovered after the 1915 Ocean Park Pier fire. When they were cleaning up, they pulled down some of the Japanese gambling games wheels and found intricate electrical wiring on the under side of the spindles. These games' legality were also questionable. Arrests were made periodically by crusading district attorneys and local police. Larger scale gambling was also de-rigueur. Whether the gaming took place in private dining rooms at the Ship Cafe or in small casinos in the basements of various hotels and restaurants, if one were looking for a place to lose money it was easily found. In September 1923 the police raided a gambling club that occupied the quarters of the Submarine Garden, once a high class cafe beneath the old Dome Pier. They found a maze of tunnels connecting a labyrinth of gambling rooms, cards and $150 on the tables, then arrested fifteen alleged gamblers. As soon as Charles Lick found out about it, he closed the club. During the years that Prohibition was in effect, (1920-1933) Canadian liquor was smuggled into Venice from off-shore rumrunners by high-powered motorboats that docked beneath the pier in the dead of night. Mobster Tony Cornero ran the operation. Kinney's underground utility tunnels along the alleys on either side of Windward Avenue proved handy to the smugglers who delivered to "speakeasy" bars in the basements of the business district. There were a few newspaper accounts of police engaging in shoot-outs with rumrunners along the beach near the Ocean Park Pier. It was an open secret that there were "speakeasy" in the basements of the Antler Hotel on the lagoon and beneath Menotti's Grocery store and other businesses on Windward. A man lift in the back alley behind the store carried those that gave the right password from the hide-away street level door to the sinful caverns below. Considering the amount of police corruption in those days, it isn't surprising that there were rarely any raids and arrests at these places. "Dry agents," however, did crack down and raid various houses in the area, especially along the sparsely populated Venice peninsula, where they confiscated huge caches of liquor. While few people were spending money on amusement rides during the Depression, they were spending it on bingo or at least a variation of the popular game. Bingo was considered a gambling game and therefore was illegal in Los Angeles. However, the clever game operators invented variations that allowed the customers to use their "skill" to select the numbers called. This might involve tossing marbles in a grid, or rolling balls down an incline. Game cards costing a nickel to a quarter, depending on the number of players, offered prizes of $1.50 to $50.00. One of the most successful operators was John Harrah and his son Bill. The former Venice mayor was badly in debt after the stock market crash, yet owned mortgages on a number of beach properties far above their deflated value. One such property was the Plaza building at the entrance to the Venice Pier. At the time it housed mostly bowling alleys and a pool hall. They decided to use part of the empty space to open up a variation of bingo which they called the "Circle Game." Players sat at a large circular style bar during the game and marked their bingo cards. A revolving game board with its connecting runway was placed in the center. Each player in turn determined the next number by rolling a ball down the runway so that it landed into one of the numbered slots. The 32 seat parlor grossed $100 the first night it opened on July 4, 1932. The Harrahs were so successful that they soon opened a second game called Tango, then a third. In 1934 the state passed a law outlawing bingo as a game of chance at his parlors and others that lined the coast. The police and county sheriffs raided the games to shut them down. The arresting officer became confused when Harrah's game didn't even look like bingo. They managed to stay open nearly six months after everyone else was closed by constantly changing the games and keeping one step ahead of the law. The legality of the games were constantly challenged in court, but there were still periodic raids and closures in 1935 and 1936. While Harrah became fed up with the constant legal trials and uncertainties and moved to Reno in 1937, others evolved the game into a variation called Bridgo. It lasted until after World War II when a final courtroom test closed the "games of skill" for good. The late 1930's brought back the popularity of the offshore gambling boats. A fleet of these boats began in 1929 with the operation of the Tango anchored five miles directly west of the Venice Pier. Water taxis would deposit gamblers at these floating casinos that sometimes offered entertainment and dancing in addition to crap tables and roulette. 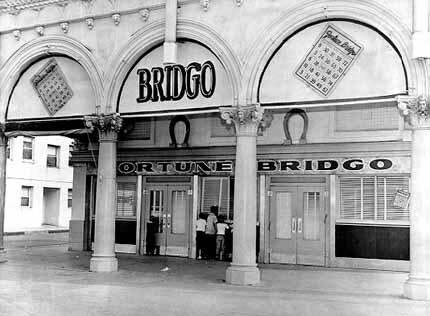 In 1938 Tony Cornero converted a 41 year old brigantine into a gambling ship. It had a superstructure especially designed as a luxury gambling casino. His investment, rumored to be $600,000, was financed by Bugsy Siegal and George Raft. He towed his boat exactly 3.1 miles offshore, and announced by radio and newspaper advertisements that he was open for business. He offered a challenge, a $100,000 reward to anyone who could show that any game on the Rex was rigged. It was a first class operation with good food, top name dance bands, unwatered booze and honest games. Gamblers had a choice of playing craps, roulette, blackjack, chuck-a-luck, high spade, wheel of fortune, Chinese lottery, stud poker and faro. There were Tango layouts between decks and 150 "one armed bandits" lined the casino walls. The operation was a success and netted Tony $300,000 per month. The Rex and the other gambling boats were a thorn in the side of anti-gambling forces. The local authorities could do nothing because they operated just beyond their jurisdiction. Police often harassed the water taxi service, but their efforts were struck down in court. Finally California Attorney General Earl Warren decided to take action. He armed himself with nuisance abatement warrants and went after the gambling fleet. He had no difficulty shutting down two boats in Long Beach and the Texas off Venice, but the Rex didn't give in easily. Cornero got wind of the operation when seventeen unarmed plainclothes officers tried to sneak aboard the ship with the other customers. Bouncers spotted them easily and escorted them off the ship. Warren rounded up a flotilla of State and Game boats, manned them with deputies and ordered them out to the Rex. Cornero was ready and repelled the invasion with high pressure hoses. The authorities laid siege for nine tense days while Cornero's men stood guard with sub-machine guns. His attorneys filed suit after suit charging Warren with everything from harassment to piracy. Then Tony Cornero unexpectedly surrendered on August 9, 1938. The war moved to the courts. The high court finally ruled a year later that the three mile limit in the Santa Monica Bay extended from an imaginary line connecting Point Dume to Point Vicente. Tony had to pay fines and court costs.